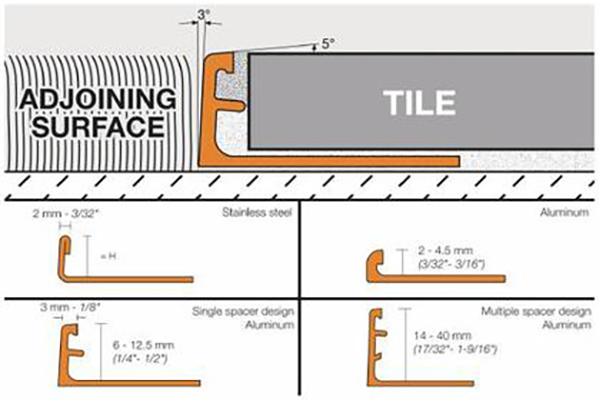 Schluter-SCHIENE is designed to provide edging for tile coverings. Typical applications include edge protection where tile is bordered by carpet, at expansion joints, or as a decorative edging for stairs. Schluter-SCHIENE is available in numerous finishes; stainless steel, solid brass, aluminum, and anodized aluminum. The profile features a trapezoid-perforated anchoring leg, which is secured in the mortar bond coat beneath the tile, and an 87° sloped vertical wall section that transfers point loads to the substrate and surface covering while protecting the tile edges from damage. Schluter-SCHIENE, in solid brass, aluminum, and anodized aluminum, features a 5° sloped top flange and fillet at the anchoring leg/vertical section interface to enhance edge protection by reducing stresses on the tile, and, in sizes greater than 1/4″ (6 mm), features an integrated joint spacer that establishes a defined joint cavity between the tile and the profile. 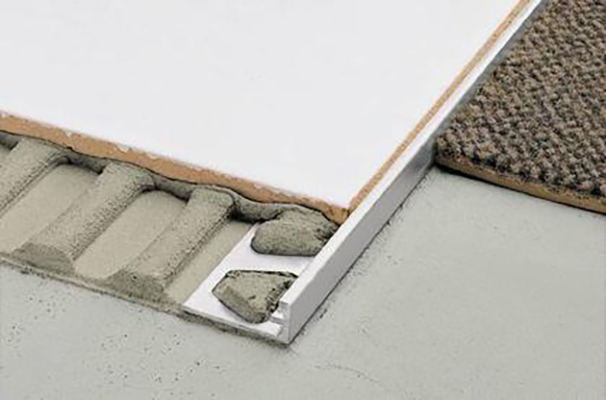 Schluter-SCHIENE, in stainless steel, is roll-formed and does not feature an integrated joint spacer. The anchoring leg of Schluter-SCHIENE, in all materials, is available with a special radius perforation “R” so that the profile can be used to form curves. 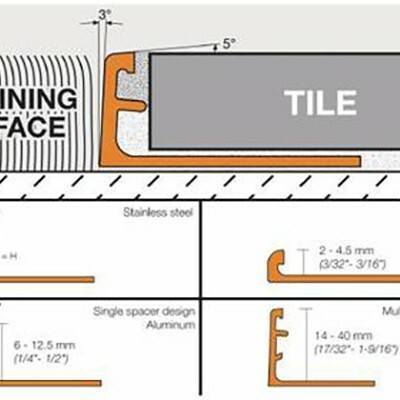 Select Schluter-SCHIENE according to tile thickness. Using a notched trowel, apply thin-set mortar to the area where the profile is to be placed. Press the perforated anchoring leg of the profile into the mortar and align. Trowel additional thin-set mortar over the perforated anchoring leg to ensure full coverage and support of the tile edges. Solidly embed the tiles so that the tiled surface is flush with the top of the profile; the profile should not be higher than the tiled surface, but rather up to approx. 1/32″ (1 mm) lower. Set the tile to the integrated joint spacer, which ensures a uniform joint of 1/16″ – 1/8″ (1.5 – 3 mm). With the stainless steel profiles, leave a space of approximately 1/16″ – 1/8″ (1.5 – 3 mm). Fill the joint completely with grout or setting material. Work with materials and tools that will not scratch or damage sensitive surfaces. Setting materials and grouts must be removed immediately, especially from anodized aluminum surfaces. Schluter-SCHIENE is available in stainless steel, solid brass, aluminum, and anodized aluminum.In special cases, the suitability of a proposed type of material must be verified based on the anticipated chemical, mechanical, and/or other stresses. 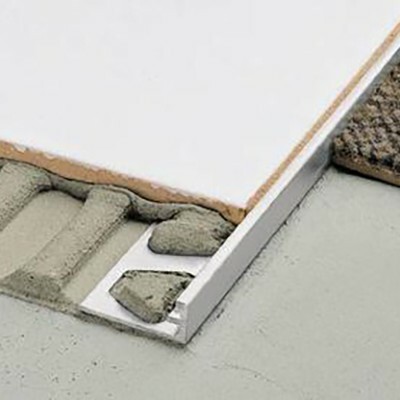 Schluter-SCHIENE, in solid brass, sustains high levels of mechanical stress; for example, as edge protection for movement joints in coverings exposed to industrial traffic. Brass is resistant to most chemicals used in tiled environments. Solid brass that is exposed to air will oxidize, resulting in a natural patina. If exposed to moisture or aggressive substances, heavy oxidation and spotting may occur. Schluter-SCHIENE, in aluminum, must be tested to verify its suitability if chemical stresses are anticipated. Cementitious materials, in conjunction with moisture, become alkaline. Since aluminum is sensitive to alkaline substances, exposure to the alkali (depending on the concentration and duration of exposure) may result in corrosion (aluminum hydroxide formation). Therefore, it is important to remove mortar or grout residue from visible surfaces. In addition, ensure that the profile is solidly embedded in the setting material and that all cavities are filled to prevent the collection of alkaline water. Schluter-SCHIENE, in anodized aluminum, features an anodized layer that retains a uniform appearance during normal use. 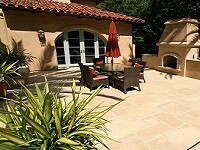 The surface, however, is susceptible to scratching and wear and may be damaged by grout or setting material. Therefore, these materials must be removed immediately. Otherwise, the description regarding aluminum applies. Schluter-SCHIENE requires no special maintenance and is resistant to mold and fungi. Cleaning the Schluter-SCHIENE profiles should be done using common household cleaning agents. Stainless steel surfaces exposed to the environment or aggressive substances should be cleaned periodically using a mild household cleaner. 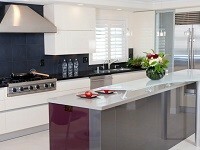 Regular cleaning maintains the neat appearance of stainless steel and reduces the risk of corrosion. All cleaning agents must be free of hydrochloric and hydrofluoric acid. Stainless steel surfaces develop a sheen when treated with a chrome-polishing agent. Oxidation films on exposed solid brass or aluminum can be removed by using a conventional polishing agent, but will form again. In the case of anodized aluminum, do not use abrasive cleaning agents. Damage to the anodized layer can be repaired by applying varnish.